Enhanced with innovative features, the Avision AD250F offers high throughput of 80 ppm and 160 ipm in a compact footprint conserving both space and budget. 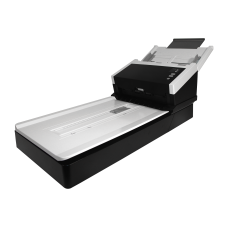 Unlike common sheet-fed scanners which provide only the auto document feeder and can not accommodate irregular sizes and weights of paper, the AD250F harmoniously combines the benefits of the fast scan rate of the ADF and the convenience of the flatbed unit to meet customer's diverse requirements. The AD250F boasts a unique and innovative design in comparison with its predecessors - the ability to accommodate form document up to 242 x 356 mm (9.5 x 14 in.). The extended document width from standard 216 mm (8.5 in.) to 242 mm (9.5 in.) makes the AD250F more competitive to fit for a wider range of documents. Designed with the innovative reverse roller for advanced paper separation capability, the AD250F delivers outstanding feeding reliability and operating productivity by effectively reducing the risk of a multi-feed or paper jam. The advanced Paper protection technology protects valuable paper from being wrinkled or torn by halting the scan process once a skewed page is detected. Thanks to the advanced straight paper path and image processing technology, mixed batches of documents with varies sizes and weights can be scanned, appropriately cropped, deskewed, and ready to use. Scan size accepts paper from receipts 50 x 50 mm (2 x 2 in.) to business document 242 x 356 mm (9.5 x 14 in.). The auto document feeder is also robust enough to feed paper up to 400 g/m2 (110 lbs) and embossed hard cards such as ID cards, credit cards, driver's license, and health insurance card up to 1.25 mm in thickness. The AD250F delivers high throughput and outstanding performance. However, it is earth-friendly at the same time. The LED technology requires no warm up time and is lower power consumption without generating mercury vapor as other traditional scanners using the CCFL (cold cathode fluorescent lamp) technology. The scanner can be used to scan up to 10,000 pages per day through the 100-page automatic document feeder. The data indicates that this scanner is designed to scan document in any application requiring frequent document and hard card scanning. The AD250F come with TWAIN and ISIS drivers, and are bundled with a suite of powerful software applications that include Avision Button Manager , AVScan X, and PaperPort 14SE. With Button Manager , you can scan to searchable PDF, JPEG, BMP, or GIF file format, save to folder on your computer, and scan to e-mail, image editing application, or even a cloud application such as Google Drive, or Microsoft SharePoint with a press of a button. The AVScan X and PaperPort are highly effective image processing and document management software that helps you streamline your task more efficiently.